Mohamed, kinésithérapeute pour Handicap International en Jordanie, étudie la radiographie de Saed, un réfugié de 70 ans arrivé seul au camp de Zaatari, au nord de la Jordanie. Sur la radiographie, on peut voir que des éclats de mortiers sont restés logés dans ses jambes, non loin de l'artère fémorale. 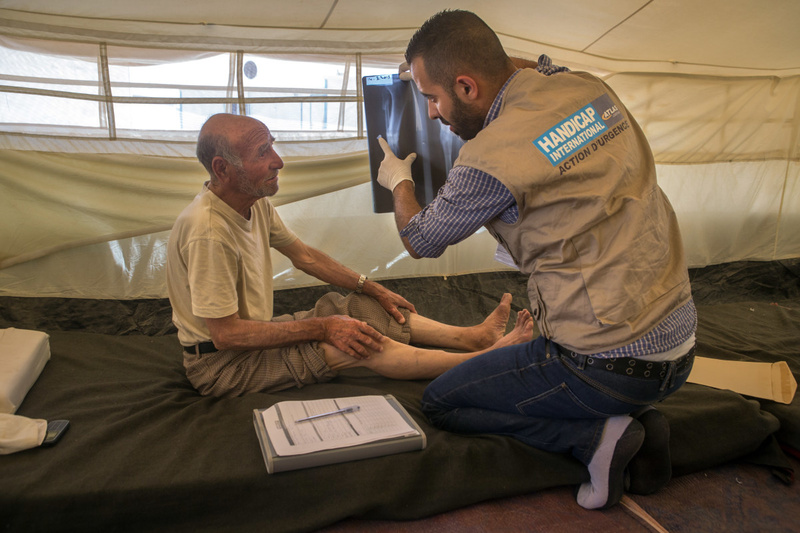 // Mohamed, physiotherapist for Handicap International in Jordan, studies the x-ray of Saed, a 70-year-old refugee arrived alone at the camp of Zaatari, situated in the North of Jordan. On the x-ray, we can see that shrapnels remain in his legs, close to the femoral artery. VOIR TEMOIGNAGE // SEE TESTIMONY. Paul Vermeulen, cofounder and former director of Handicap International Switzerland, is now in charge of Strategic Innovation at Handicap International Federation. The title sounds a bit familiar to many in corporate business. Not quite so in the nonprofit world. NGO Advisor wanted to learn more about what means Strategic Innovation to such an NGO, and what was the thinking behind it. Editor Nothias opens the discussion. NGO Advisor: What message did Handicap International want to send out by appointing a Strategic Innovation Manager? How has the organisation’s commitment to innovation grown? Paul Vermeulen (PV): This commitment began when our new Executive Director, Manuel Patrouillard, joined the organisation in 2014. Familiar with both the NGO sector and the private sector, he has a good understanding of the corporate innovation cycle with the constant need to launch new products at regular intervals. In the NGO sector innovation works in an entirely different way. NGOs work with beneficiaries who are the focus of the assessment of needs and the quality of the aid provided. Accountability is therefore an integral part of NGO ethics. They also have to work with funding bodies who need to account for how the funds they allocate are used, and require numerous reports and audits to justify the use of the funds granted, which puts further pressure on the teams and on resources. Innovating with teams who are working in complex settings is a difficult exercise: working on innovative approaches requires a certain level of human and financial resources and there is a risk these initiatives will fail – this latitude is very often simply impossible to accord. However, on the other hand we run the risk of simply continuing to use the same approaches, without ever questioning whether there is any scope for improvement. It is therefore particularly problematic for NGOs which are large enough to generate genuine innovations on their programmes. At the start of the 1980s, the founders of Handicap International reacted to the situations they discovered in the refugee camps in Thailand, where thousands of people had been amputated following landmine accidents and there were no actors capable of producing sufficient numbers of prostheses. They immediately set about working out how to produce prostheses using the materials available in situ, such as bamboo, leather, wood, rubber and metal, and began making some very simple orthopaedic equipment. The beneficiaries of these actions were able to fend for themselves again, to collect their own food from distributions for example, rather than having to cope by crawling through the dust. This also instigated the local development of a whole range of professions. This was clearly a situation where the circumstances in the field and the limited financial resources available required “frugal innovation”, although this term was not used at the time. Today, we have a much more demanding goal. We want to stimulate innovation. When you are a newly-created NGO, the structure is light enough to adapt, your internal operating procedures make you very agile. The founders are often highly-motivated visionaries. The approach is intuitive, creative and dynamic. How can we re-establish this dynamic in an organisation working in nearly 60 countries across the world and with a large workforce? How can we take time out from the day-to-day work and look at the bigger picture to develop repeated innovation approaches which allow room for failure? NGO Advisor When were you asked to take on this challenge? PV: In 2014, when the position was created. I must admit I was rather perplexed to start with. I had taken innovation training courses to develop my understanding of the issues and do my own benchmarking. The theme was not very high on the NGO agenda. It was still in its infancy and a number of major organisations launched platforms which other players found impressive. Today, the majority of actors have taken on board the need for innovation to become part of their standard operations. There are also numerous consultants proposing a variety of approaches. These do not always obtain the results hoped for and this work is an ongoing process. NGO Advisor: What was your approach? PV: In 2014, Handicap International started work on its 2016-2025 strategy and it was decided that innovation would play a role in this. Our approach was to pique our colleagues’ interest internally to encourage them to look into innovation, find out in what ways it is relevant to them, learn how to use this approach in their work and incorporate it into their management and communication, and lead them to contact external networks working on similar themes. Resources will gradually be made available to open up spaces for co-development. There are excellent external reasons for doing this: the growth in the global population, climate change, increased conflict, and non-communicable diseases are humanitarian needs which are growing exponentially whilst the resources available have plateaued. If we do not change the way we operate there is a risk that we will no longer be able to meet the needs. Humanitarian organisations are faced with the challenge of reinventing the way in which they work. If they do not do so, they will probably not survive. NGO Advisor: In terms of innovation, do you think it is possible to apply some of the approaches used in the corporate sector, such as buying out other firms, a kind of innovation by acquisition, for example? PV: Ten years ago, Handicap International merged with Atlas Logistique, specialised in the provision of technical and logistics solutions in humanitarian emergencies. Handicap International thereby enhanced its specialist expertise and was able to substantially develop its humanitarian aid provision. In the field of orthopaedic fitting, we have been working with the start-up ProsFit to produce orthoses and prostheses using 3D technology. The limb to be fitted is scanned and the file for this image is adjusted and finalised with the connectors which complete the socket. This is then printed remotely and the complete prosthesis is delivered to the rehabilitation centre. Rather than providing plaster, polypropylene, ovens for themo-moulding, full production workshops and professional training courses over several years in order to produce properly-adapted prostheses. These complete, high-quality prostheses are then delivered to the beneficiaries. The trans-tibial prostheses produced using this technology were successfully tested in 2016 in Togo, Madagascar and Syria, in collaboration with the prosthesis manufacturer Proteor and the University Strathclyde. ProsFit provided the cutting-edge technical and IT solutions and Handicap International its experience in rehabilitation and skills transfer in developing countries and emergency humanitarian settings. Here, we are not talking about an acquisition, but about a strategic alliance with a start-up. This alliance makes it possible to effect the change in paradigm that the emergence of 3D technology in orthopaedic fitting will inevitably require. NGO Advisor: : What do you see as the next challenges? PV: The WHO estimates that only 5 – 15% of the population requiring a prosthesis or orthosis have been fitted. The remaining 85 – 95% represents more than 100 million people. According to the International Diabetes Federation, in 2015 over one million people were amputated as a consequence of their diabetes, that’s one person every thirty seconds. The global prevalence of diabetes will increase by 65% in the next 15 years, bringing with it further amputations. Improving how we respond is a matter of the utmost urgency. The most difficult step is to introduce the 3D production of prostheses into the fragile rehabilitation ecosystems in less developed countries, without destroying jobs. The aim is to preserve existing professions whilst opening up the opportunity to move towards an attractive model which will substantially increase the number of people benefiting from orthopaedic fitting. Handicap International has its role to play in seeing through this social innovation. NGO Advisor: Who are the other major actors in prosthetics production in developing countries who could participate in this new approach? PV: On the one hand there are the organisations such as the WHO which publishes guidelines and the ISPO (International Society for Prosthetics and Orthotics) which develops standards and training courses for the sector. On the other hand, there are the field actors such as the ICRC which introduced thermo-moulded polypropylene components at the start of the 1990s. In order to move the rehabilitation professions towards the mass production of high quality prostheses and orthoses using 3D technology, all these actors need to work together. This will also require new approaches. We should mention the launch of the Global Humanitarian Lab (GHL) in May 2016, an initiative co-founded by UNHCR, the ICRC, WFP, OCHA, Terre de hommes and Handicap International, with support from governments, foundations, universities, companies, charitable organisations and fab lab networks. One of the key goals of the GHL is to develop synergies and collaborations, in order to avoid duplicating initiatives and making the resources available to accelerate and scale up innovation. Developing 3D orthopaedic fitting fits perfectly into this dynamic. NGO Advisor: Are you planning interventions in any other fields? PV: Handicap International has just taken part in the humanitarian Hackathon organised by THE Port at CERN on October 14 – 16 2016. The challenge is to develop innovative solutions for the mobile, pollution-free destruction of explosive remnants of war and munitions. Handicap International has been working in humanitarian mine clearance since 1992 as part of its disability prevention remit. Vast quantities of munitions need to be dealt with in numerous countries in order to prevent future generations from being exposed to land, water tables and air contaminated by the toxic compounds found in unexploded munitions. This Hackathon brought together researchers and experts in the state of the art, with the aim of exploring ways of reusing the metals and energy recovered from the explosive devices. It’s a very promising initiative!